This entry was posted in Recent Posts and tagged Adoration, Confusion, Contemplating, Esteem, Faith, Fog, Life, Philosophy, Spirit, Writing. Bookmark the permalink. Oh, no. I have permission to walk about as long as I don’t scare the longhorns. Oh! I didn’t know those were in there. Definitely. Let’s go. Oh no! That’d be fun. Do you like Pachelbel’s Canon? Yeah *laughs* I don’t know Pachelbel’s Canon. Is it nice? I wish I did. I looked it up…that’s the wedding song everyone walks to…I know this one. I didn’t know it’s name. I just arranged it, that’s why I ask. I messed it up bad. I listened to it today while I wrote. It sorta sounds the same all the way through, huh? I mean its nice…kinda long. I bet you translated perfectly. I think so eventually, yes. I do hope you like it. Now….when will I get to hear it? I have no doubt that I’ll love it. Soon, I think. Others before probably. I’m not sure. Oh dear. One should know how to make up their mind, Duke. It does repeat! The same chord sequence over and over and over again with different variations. That’s why you have to mess it up, see. Yay! Okay, I knew it did. I mean, I sorta blame that song for getting my writting started yesterday. It was just repetitive enough, I guess. Soothing. Will I get to hear what you’re doing with the song? I bet it’ll be better once you’re done with it. Yes, Adam, it can be… It comforts in many ways, you know. Since my days in San Fransisco, I love the fog. I always see things at the very edge. Nice. I love the fog, as well, John. There’s just something about how it calms. The edge is the only place to see the view. I love how similar we are…Thank you. I appreciate you thinking so! Really like the calm of the words and mist of the photo ~ a serene feeling which is just about a perfect a feeling one could have on a Monday morning. Thanks for the great start to the week. I don’t usually think of fog and mist as “felt,” but it works here. I like the analogy, too! 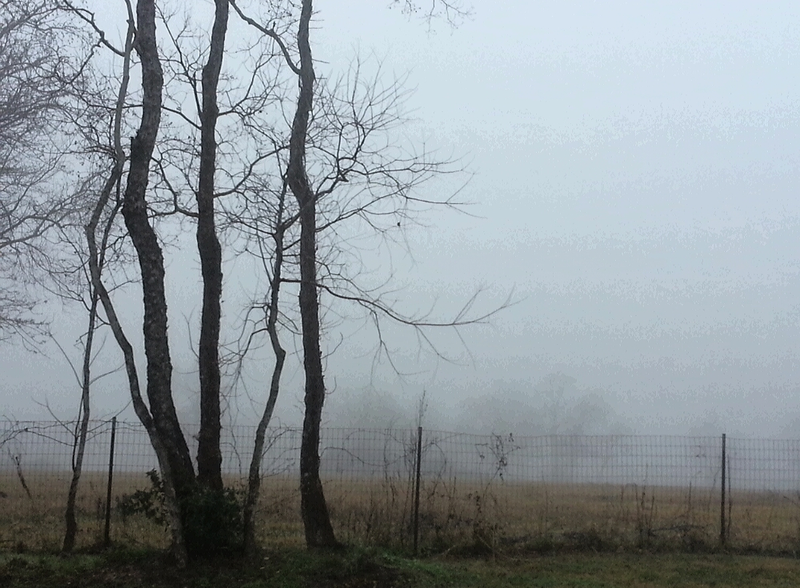 Generally, I think of fog as more of a nuisance (guess it’s my practical side coming forth). Well done, Audrey!